Home Columns Don't Blink Don’t Blink: Who’s following you? 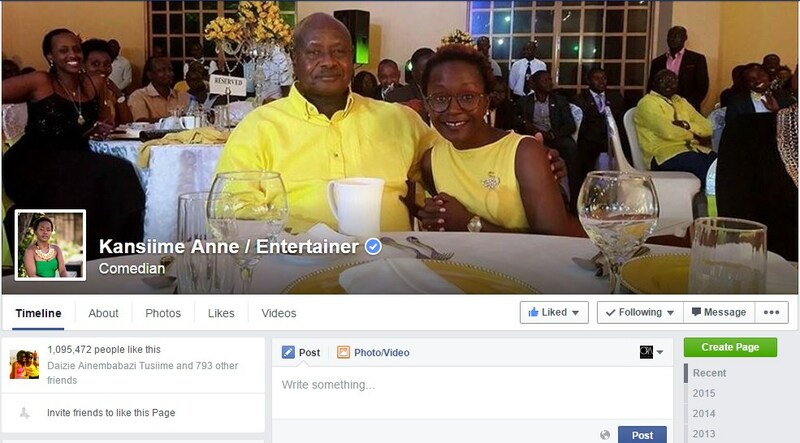 Anne Kansiime as a widely popular entertainer may not have to audit her followers like a regular person, it would be too difficult. For the rest of us, we need to often look over our shoulders. That scene, back then when the movie was newly released, caught the attention of my girlfriend and she used it to illustrate some point I had missed and cannot possibly recall even now. But it comes to mind often these days because I keep asking myself who IS following me. Not in the sense of a narcissist tweep who keeps checking to see his rating, as a method of self-affirmation and establishing a sense of self-worth, but actually checking who the people that consume one’s content actually are. Unlike a public speaker or an artiste or public performer of any kind, who puts their work on display for just about anybody that constitutes “the general public”, people who express themselves on social media are just ordinary people. But as an ordinary person, you have to be exceptionally interesting in order to attract a steadily growing number of followers. Those followers are people and organisations who, by clicking ‘Follow’ by your name, are stating that they are quite happy to receive any and every type of information you might wish to impart. As a citizen of any social media platform, you make no promises that will make followers click the relevant button. Besides your profile and the last couple of twenty posts that you did, people make the decision to follow you without a clear (to you) motivation for doing so. Of course, this does not apply to the likes of Yoweri Museveni, Anne Kansiime and all the other celebs that we are always hoping will follow us for some reason or another. Some of us write our profiles out in such a way that if anyone reads it they will be compelled to follow us; but most social media users are just being on the social media platform in question and not doing much to increase their followers. These days, though, I have noticed a steady rise in the number of followers (most of them unknown) that I find behind my name, and I strongly suspect that there is a thick link to political activity. Whereas every week I have averaged a consistent number of new Twitter followers and Facebook friends, since about February this year that number has increased significantly. My issue, though, is not with the numbers themselves, but with the identities of many of the new followers: for some reason, many of them have just joined Twitter or Facebook, have zero followers – or less than ten, at any rate – and have never tweeted or posted anything that says who they actually are. On Facebook, I keep seeing awkwardly airbrushed profile photographs and a couple of entries in their photo albums that have no link whatsoever to their profile pictures, even though we sometimes have many “mutual friends”. And that was before all those Facebook “ladies” who started sending loose greetings into my inbox, sometimes even pre-fixing them with my name as if we are well acquainted. There are contacts who insinuate themselves into your life by doing all the ordinary friend things – wishing you good morning and good night, a happy birthday, and congratulating you on this and that for so long that you forget you actually don’t know them offline. Some people call all these “stalkers”, others “trolls”, others yet, “bots”. I don’t care what they get called provided that I can identify them and avoid getting stung by them one way or another – now or in the future. They may seem harmless sitting around watching your time line right now, but these are the chaps who could be gathering clues about you from your different posts and building up a databank of information to use in hacking into your life later on. Or, enough of them could gather round you one of these days and rollick you to no end of distraction, or engage you on a matter that might not be on your agenda or of any interest to you. That’s why if you’re an ordinary user, in the sense that you are NOT a celebrity with hundreds of thousands of followers that would make the following difficult, you should spend time every so often to audit your followers. Auditing your followers does NOT mean deleting the ones you don’t like (though you certainly have the right to do so), but it does mean being clear about who you are having a conversation with (Twitter, for instance). It’s the same as establishing who’s in the audience at a public event one is scheduled to speak at – so that you appropriate your thoughts and delivery. But auditing your followers MAY involve deleting or blocking the ones you don’t know or wish to speak with. That’s the same as walking away from a person you don’t want to talk with, at a party or something. It’s easier at a party, of course, because you get to say something like, “Excuse me while I go to wash my hands…” or you pretend to be receiving an urgent phone call and walk off while attending to it. On these platforms we occupy, though, it is a little harder to be polite unless one employs a few social hacking tricks. When you come across that strange contact whose identity is very unclear to you, initiate a conversation to draw them out a little bit or to get to know them – and feel free to copy in a couple of other people who might help evaluate your suspicions. Look out for the timelines of activity that these persons engage in, to give you a clue as to what time zone they might be located in. And also observe what they talk about and who they associate with most – that gives you even more clues as to who they might be. Some of them are more active or aggressive than others, and might engage you with much more confidence than you would expect, but go back into party mode where you would think twice before sharing certain details with someone you don’t really know. In fact, when dealing with people online one should follow more or less the same rules that we follow off-line. Without being paranoid, it’s good practice to look over your shoulder every so often as you head home, just to see if there’s anyone following you and if so, to identify who’s following you. Next articleWhat is left for banks if Mobile Money is offering everything with “ease”?